We supply an extensive range of business gifts and corporate promotional products to help promote your business. 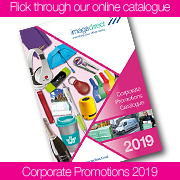 We take the hassle away from researching numerous suppliers and catalogues, selecting the promotional item and project managing the personalisation, ordering, stocking and distribution. Just tell us the campaign, event and budget and we will do the rest, offering a selection of options, sourced and personalised to your requirements. Our products can be personalised with any message or company logo, and can be used in a variety of different environments to build a presence for your company. The effectiveness or promotional products in marketing your business is second to none. From leaving a prospective client with a branded pen at the end of a meeting to wowing your customers with creative, memorable gifts, our products will make sure that you make an impact.